NOTE: Die heads do not include dies. Order dies separately. Die Head 2-1/2" - 4"
All pipe and bolt machine dies are made of high speed steel (except where noted) and can be re-sharpened for longer die life. Expert die grinding ensures consistent high quality and long lasting dependability. Available in two-position or four-position settings up to 2". See following table for the right part number for use with your machine. 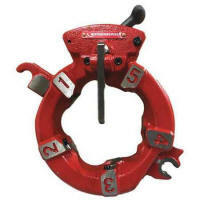 Fully adjustable, truly versatile die head for up to 2" pipe and 2-1/4" bolt. Sizing is manual, but still a simple operation. Uniquad® Die Head uses four sets of interchangeable high-speed steel dies: 1/8", 1/4", 3/8" 1/2" 3/4" or 1" - 2"
We can re-sharpen any brand High Speed Steel and Stainless Steel dies, expert die grinding ensures consistent high quality and long lasting dependability at a fraction of the cost of a new die set.